"Suicide is a significant national public health problem, especially among lung cancer patients and among veterans," said lead author Donald R. Sullivan, MD, MA, assistant professor of medicine at Oregon Health & Science University, core investigator at the Center to Improve Veteran Involvement in Care at the Portland VA and member of the OHSU Knight Cancer Institute. "We wanted to see if palliative care, which has been shown to improve quality of life, reduced suicides among veterans with stage IIIB and IV lung cancer." The researchers found that among 20,900 lung cancer patients in a VA cancer registry, 30 committed suicide–a rate more than 5 times greater than the average in veterans of a similar age. 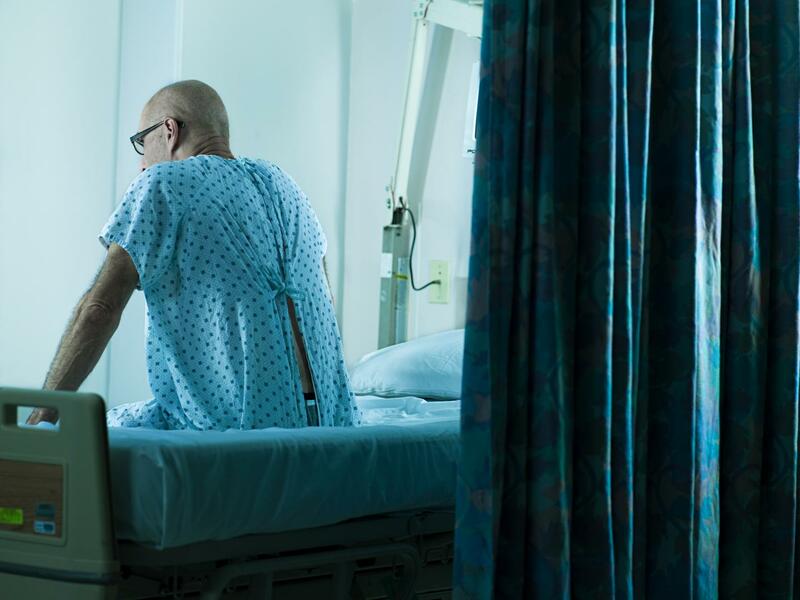 However, those lung cancer patients who had at least one palliative care encounter after their diagnosis were 82 percent less likely to die by suicide. Palliative care aims to relieve physical pain and discomfort and to address psychological issues like anxiety that diminish quality of life for those with life-threatening illnesses. Palliative care is patient-centered, allowing patients to determine care preferences and to make advance care planning decisions in the event they can no longer make their own decisions regarding care. The authors believe their study is the first to explore the relationship between palliative care and suicide risk in cancer patients. According to Dr. Sullivan, several medical societies recommend palliative care for all patients with advanced stage lung cancer; however, there is a gap between those recommendations and practice. "There are many barriers to palliative care, and unfortunately, some are related to clinician referrals," Dr. Sullivan said. "Not all doctors are aware of the benefits of palliative care." Health care systems can play a role in educating physicians about palliative care and encouraging them to refer patients to these services, Dr. Sullivan added, noting that the VA system has initiatives to do just that. "I think the VA is doing a better job than other health care systems, but there is still room for improvement." Dr. Sullivan believes palliative care should be offered to all patients shortly after receiving a diagnosis of advanced stage lung cancer. "The best scenario is an integrated approach, in which patients with serious illness receive palliative care along with disease-modifying therapies like chemotherapy at the same time," he said. Study limitation include a small sample size and lack of information about suicide attempts and substance abuse. Because women are under-represented in the VA health care system, study results may not be generalizable to them. Nevertheless, "the risk of suicide is underappreciated among cancer patients, especially those with advanced stage disease," Dr. Sullivan said. "This study shows another potential benefit of palliative care among lung cancer patients." Authors: D. Sullivan1, C. W. Forsberg2, S. E. Golden2, L. Ganzini3, S. K. Dobscha2, K. C. Vranas4, C. G. Slatore5; 1Division of Pulmonary and Critical Care Medicine, Oregon Health & Science University, Portland, OR, United States, 2HSRD, Veterans Affairs Portland Health Care System, Portland, OR, United States, 3Division of Psychiatry, Oregon Health & Science University, Portland, OR, United States, 4Pulmonary and Critical Care, Oregon Health and Science University, Portland, OR, United States, 5Veterans Affairs Portland Health Care System, Portland, OR, United States. Background: Suicide is a leading cause of death in the U.S. and rates are increasing among Veterans. There are increased rates of completed suicide among cancer patients with the highest rates among those with lung cancer. Cancer patients report unmet emotional needs and a desire for psychological support during and after completion of cancer treatment. The incidence of suicide and approaches to decrease suicide risk, specifically among Veterans with lung cancer, are largely unexplored. Methods: Advanced stage lung cancer patients (IIIB & IV) in the VA Healthcare System diagnosed from January 2007- December 2013 were examined using VA data sources including inpatient, outpatient and fee-basis encounter data as well as the Central Cancer Registry and the Suicide Data Repository. Patients were considered to have died by suicide if cause of death (COD) was listed as ICD9-CM (E950.x) or ICD10-CM (X60-X84). Palliative care receipt was defined as having been provided if a specialty palliative care encounter was documented after a lung cancer diagnosis. Incidence rates of suicide were calculated from the number of cancer patients at risk (from year of diagnosis to year of death) and the number of suicides in each year. Multivariable logistic regression was used to examine the association between palliative care and suicide as COD. Conclusions: Veterans with lung cancer are at high risk for completed suicide. Palliative care was associated with a reduced risk of death by suicide. Benefits of palliative care, such as improved symptom control and quality of life, may manifest in improved survival if they reduce the subsequent risk of suicide among patients with lung cancer. Further research into the potential benefit of palliative care on suicide risk in cancer patients is warranted.